Fabulous 5th Grade Fun: This is Epic! Free books! Epic! is an iPad app that gives your students instant access to thousands of books. Teachers and librarians can create an educator account so they have access to all the books. A ton of my favorite books! There are comic books, graphic novels, picture books, chapter books and even some really great nonfiction books. 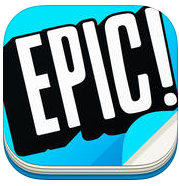 "With over 5,000 books available now and more than 300 new titles added each week, Epic! has been called the “Netflix of kids books” – it’s an unlimited library your kids can take anywhere!" They have numerous categories for finding books. One last thing . . . A big thanks to Epic! Thanks for creating a fantastic free app that helps teachers promote literacy in their classroom.